2 October 2011 by J.M. 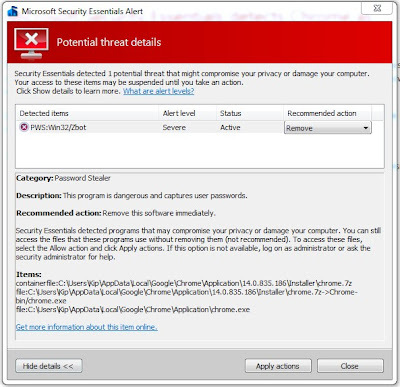 Microsoft has published a signature update for the security tools Microsoft Security Essentials, Microsoft Forefront and Windows Defender. It fixes an erroneous patch causing Google’s Chrome web browser being falsely detected as part of the PWS:Win32/Zbot trojan horse, also known as Zeus. Users had been counselled to delete the chrome.exe file. After the patch had been released, numerous users in Google’s support forum as well as on Twitter talked publicly about the issue. A Microsoft spokeswoman declared that in 3,000 cases, Google Chrome was uninstalled by one of the mentioned security tools. Google tells users to install the patch fix first, then to reinstall the browser. According to a Google blog post, an update is going to be published fixing the error automatically.